My interest in food began in Glasgow in the late 1960’s. I realised early on that there had to be more to cooking than boiling vegetables into submission and serving them up with a mutton chop, ‘mince’ or a fillet of haddock. Food was wholesome and basic; there just wasn’t a lot of variety. It was Elizabeth David who introduced me to the idea of taste. I devoured her books (not literally) and began to experiment with herbs like tarragon and thyme, garlic and olive oil. Most Scots still thought that mushrooms were exotic, garlic was highly suspect and olive oil was something you bought at the chemist, in tiny bottles, as a cure for earache. By 1971, my taste buds were crying out for more taste. My call was answered in the form of my future husband who introduced me to the dizzy delights of Syrian food, and there began my food journey that has never stopped. Over the next 25 years, I lived and learned and cooked in the oldest inhabited city in the world –Damascus; in the Saudi Arabian desert where temperatures reached over 50 degrees centigrade and we prayed that the water-cooler wouldn’t break down again; in the intensely humid town of Ruwi, in the Sultanate of Oman; and in the villages of Tala and Droushia in Cyprus. I peered into saucepans; I asked lots of questions and gathered recipes and advice from anyone who would listen to me. Food is a wonderful way to communicate, especially when you don’t speak the language, and wherever I went, the local people were only too happy to share their knowledge with me. Although my husband had taught me to cook a few Syrian dishes in Glasgow, my first real introduction to Middle Eastern food was when we landed in Damascus in 1972. Newly married, we had travelled overland by car, with all our belongings and our dog Felix in the back. We camped and ate our way through Europe, and by the time I reached Damascus, boiled cabbage and mince were distant memories. The first day I stepped out of our flat into the streets of Damascus with Felix on his lead, I was overwhelmed by the sun for a start, by the light, the noise and the people. Most of all I was overwhelmed, captivated and overexcited by the strange fruits and vegetables piled up in the markets. I thought they were exotic and vibrant compared to the bland fruit and vegetables that lay in boxes in the dim, quiet interior of our local greengrocer’s shop in Glasgow. I had never seen such an abundance of gorgeously coloured produce. So, I bought some of everything, staggered home with them and then hadn’t a clue what to do with them. The next step was to learn to cook them and I hatched a plan. Every morning, I would visit my in-laws who lived downstairs and watch as their cook, Fatmeh prepared their midday meal. Then I would go out, buy the same ingredients and try to recreate the same dish for our evening meal. This worked, most of the time, and amongst other things, I learned pretty quickly that parsley is not a good substitute for fresh coriander. This bounty of food ended when we moved to a construction camp in the Saudi Arabian desert. There were only two other women in the camp, one Swedish and one Egyptian and all of us were married to the engineers who were building a bridge over Wadi Turabah. Every week, I made a shopping list, gave it to our Bedouin driver, and hoped that the supermarket, 200 miles away in Jeddah, would send what I wanted. As I thought I would have a lot of time on my hands, I had taken along a paperback copy of Cordon Bleu Cookery to practice my cooking skills. However, I hadn’t taken into account that, although we could buy a wide range of food from the supermarket, it was all preserved in a tin, a jar or a packet. My fledgling cooking skills were sorely tested but we survived. We drank copious amounts of Tang, powdered fruit juice that you mixed with water, and ate tin after tin of Danish Butter Cookies. The empty tins made excellent baking tins. We lived in 3 different camps during our time there and everywhere I went, I was vigilant about checking my desert boots, clothes, the bed to make sure there were no snakes or scorpions hiding in them. This was even more important after my son, Kazem, was born. I wish I had known then about focussing on what you do want and not what you don’t want because in the second camp we lived in, I was stung by a huge, black scorpion that nearly killed me. But that’s another story. After 4 years of living in the desert, we moved to Muscat, the capital of Oman. By this time we had two boys – Kazem, 4 years old and Shamil, 3 months old at the time. 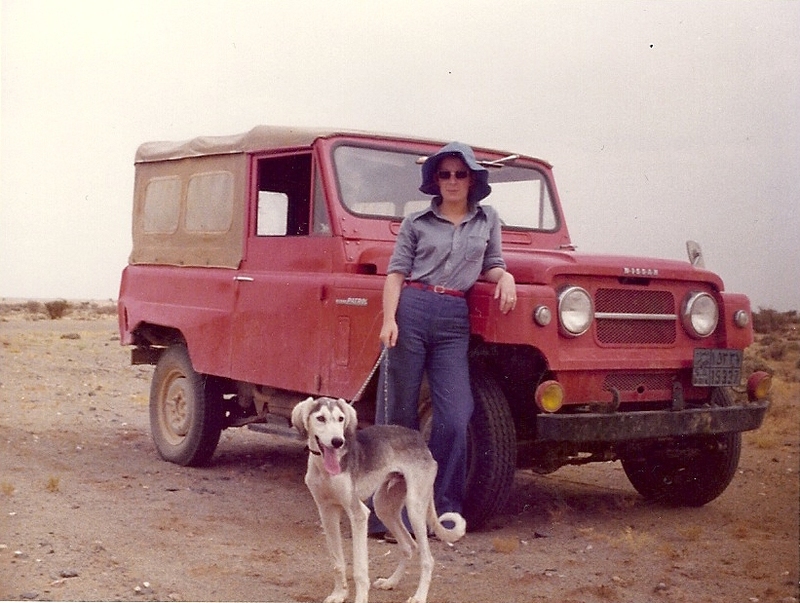 We lived in Muscat for a year, in an expat compound. Our large, modern villa was air-conditioned and cool with huge picture windows which constantly ran with water on the outside because of the high humidity. It was intensely humid at all hours of the day and night, in stark contrast to the Saudi desert where it was intensely hot during the day but mercifully cool, even cold, at night. After Saudi, the abundance of fish and seafood, fresh fruit and vegetables was a relief. With a weekly visit to the Kowloon club to eat authentic Indian curry, Indian takeaway stalls that sold delicious homemade food and having a cook, at home, I did not have to do much of the cooking. One of my abiding memories of Muscat, apart from being stung by a scorpion again, was of buying huge groupers from a wizened, old, nut-brown man on the waterfront. That’s all he sold. When you asked for one, he would quickly and liberally sprinkle the fish with salt and spices then lower it into a barrel of boiling oil that sat over an open fire. The challenge was to drive home as quickly as possible and eat it before it was cold. It was delicious. In 1980, we moved to southern Cyprus with our two sons, into a house we had been building over the years, in Tala, a village near Paphos. My neighbours were very generous with their advice and their hospitality and showed me how to make many authentic Cypriot dishes that have, not only Greek, but also Turkish and Arabic influences. We tried to be self-sufficient but the ground was too chalky for growing vegetables and we didn’t really take it seriously. There was too much to do – eating, going to the beach, visiting other parts of the island. There was also an abundance of locally grown fruit and vegetables and other fresh produce that we could buy in the market, for very little money. I had all the ingredients I needed to try out my new recipes. In 1983, we split up, sold the house and I moved into a flat in Paphos with my two sons. I began another chapter in my life and my cooking adventure. My new partner and many members of his family were repatriated Cypriots from London. They very kindly allowed me to peer into their saucepans and ask questions and this time there was no language barrier. We rented a house in Droushia, a village that sat 2,000 feet above Paphos. We spent most weekends in the summer there and entertained friends and family every Easter and Christmas. My partner was not only a doctor but his family originally came from the village. As there was no doctor in the village, the villagers started coming for impromptu consultations almost from the moment we arrived. Advice and medication were given freely and generously and they repaid him with things that were, to me, more important than money – food. They brought grapes from their vineyards, fresh figs from the trees, huge plastic containers filled with homemade halloumi, newly laid eggs, and the occasional rabbit or chicken. In 1997, I left Cyprus and returned to Scotland with Shamil, (Kazem, was already in the UK). I discovered that food had moved on since the 1970’s and I could buy almost everything I needed to cook the food I had learned to make in the Middle East and Cyprus. I’m always learning and nowadays I like to experiment with a whole range of dishes from all over the world, whatever takes my fancy. Baking is another passion and when I’m feeling tired or can’t think of anything to write about, I often go into the kitchen and whip up a batch of scones or a cake. Concentrating on getting the measurements right or rolling out pastry focuses the mind and by the time the scones or cakes are in the oven, I’m usually feeling wide-awake.